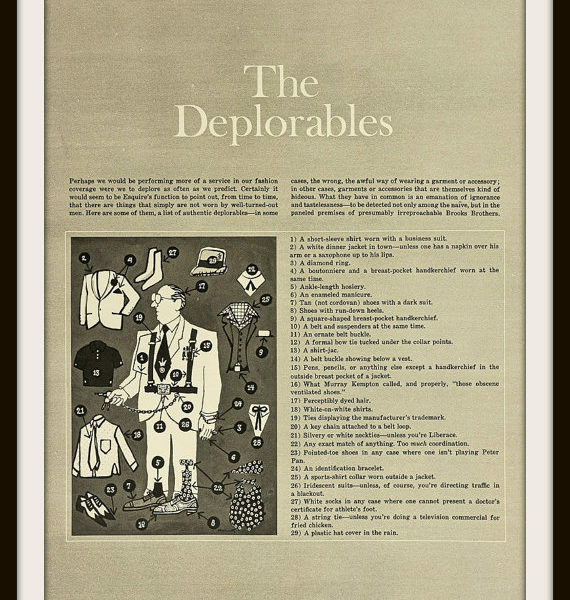 Hillary Clinton wasn’t the first to use the word deplorable as a noun. 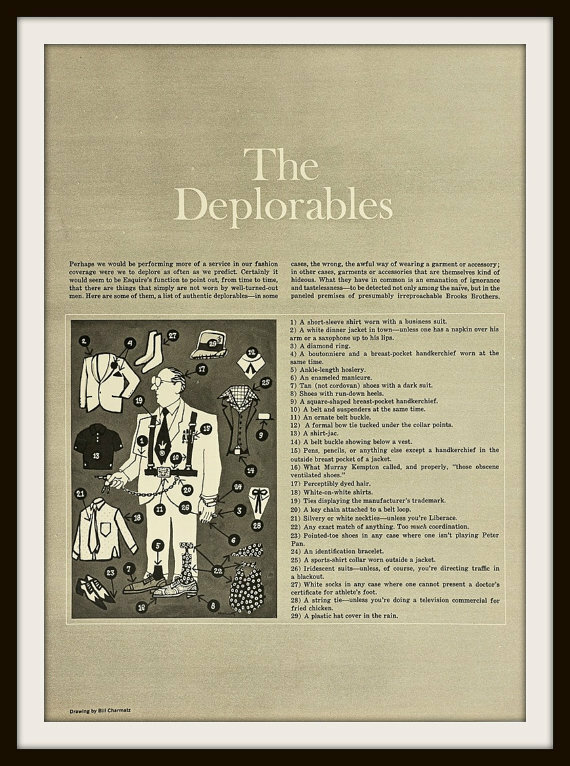 Back in 1968, the editors at Esquire put together a list of twenty-nine items they considered tasteless and awful, which they grouped together under the banner “The Deplorables.” The article was accompanied by an illustration from Bill Charmatz, showing a goofy looking fellow wearing said items. A short-sleeved shirt worn with a business suit. A white dinner jacket in town – unless one has a napkin over his arm or a saxaphone up to his lips. A boutonniere and a breast-pocket handkerchief worn at the same time. A belt and suspenders at the same time. A formal bow tie tucked under the collar points. A shirt-jac. (Derek: Boo. They’re not always the most flattering, but when worn well, they can be great layering pieces). A belt-buckle showing below the vest. Pens, pencils, or anything else except a handkerchief in the outside breast pocket of a jacket. (Derek: I don’t mind sunglasses). Ties displaying the manufacturer’s trademark. Silvery or white neckties – unless you’re Liberace. Any exact match of anything. Too much coordination. Pointed-toe shoes in any case where one isn’t playing Peter Pan. A sports-shirt collar worn outside a jacket. (Derek: Not for me, but some guys these days do it well). Iridescent suits – unless, of course, you’re directing traffic in a blackout. White socks in any case where one cannot present a doctor’s certificate for athlete’s foot. A plastic hat cover in the rain. You can find an original print of the article here.